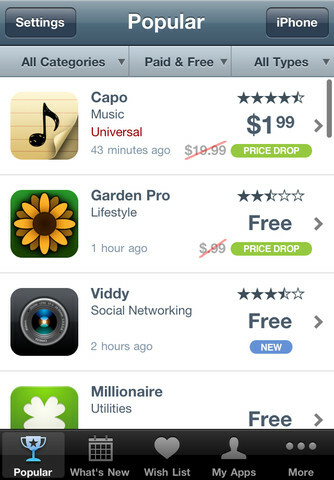 Today brings a high profile removal from the App Store, as the popular AppShopper app is now missing from the store. The removal, publisher Arnold Kim confirmed to us, has to do with a new rule that Apple added back in September which governs the promotion of apps not your own inside your apps. A low volume of behind-the-scenes developer noise about the issue has been going on since the original discovery. We’ve heard that several were in talks with Apple about why their apps should be approved anyway and that there had been rejections delivered based on the rule. As I mentioned when the news broke, any app that offers an extensive list of apps will need to worry about this new rule. Specifically, you’re going to have prove to the App Store review team that your app offers more benefit than Apple’s own offerings. I spoke to Ben Guild, developer of app discovery tool App Map, who noted that Apple’s intentions seemed fairly evident. Despite AppShopper’s absence, there are still dozens of other apps that provide very similar functionality. Perhaps it was a high profile target. With the removal of AppShopper, it’s looking like Apple is very serious about how this rule is interpreted. So, if you’re a developer that offers extensive functionality that makes it appear and work very much like the App Store, I’d start worrying.